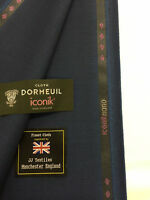 DUGDALE BROS Grey Checked Super 100's Wool & Summer Kid Mohair Fabric. 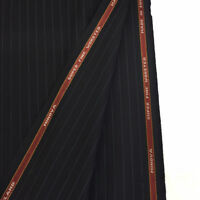 MINOVA 3.5 metres Navy Stripe Superfine 100% Worsted Wool Suit Fabric. WILLIAM HALSTEAD Postman Blue/Grey Luxury Worsted & 2PLY Mohair Suit Fabric. DORMEUIL "Voyage" Charcoal Grey Striped Worsted Wool Suit Fabric. WILLIAM HALSTEAD Dark Navy Summer Kid Mohair & Super 130's Wool Suit Fabric. WAIN SHIELL 3.5 metres Brown Super 130's Worsted Wool & Cashmere Suit Fabric.